I absolutely love the boxy shape on my little girl. Man, I wish I could get away with half the clothes she wears! Her wardrobe is way better than mine, I totally have closet envy, towards my 2 year old. 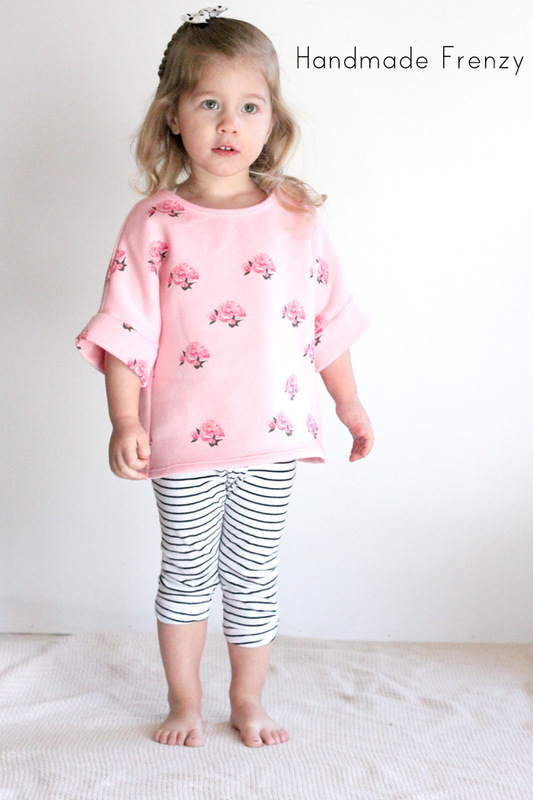 Size Sewn: 18mo - lengthened 2"
Still have 2 more shirts that are high on the priority list for finishing by Monday... Crossing my fingers I can squeeze them in!! Thank you Tasha!! Oh man, that's a tough resolve... Go you!! There are so many patterns I want right now. See Kate Sew, Shwinn & Shwinn, Cali Faye Collection... TOO many. This is super sweet! 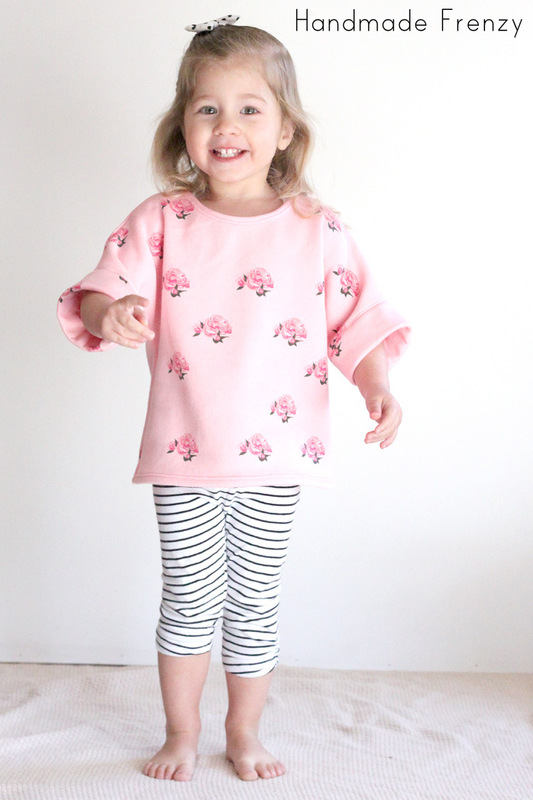 Love the floral with the stripes, and the boxy look is adorable! 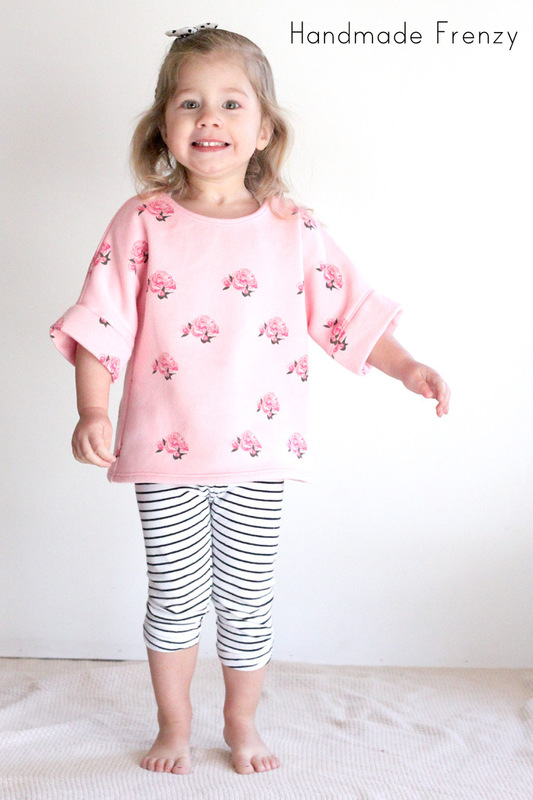 I have the recess raglan and I love that one...oh, if only i could buy all the patterns!!! Thank so much Monica! I know it, why are there so many awesome ones!?! This is SO cute! Love the shape and the fabric. Is this type of fabric difficult to work with? I really want to work with more knits but they intimidate me so much. THANK you Alexis!! This fabric is very very easy to work with actually! It is sweatshirt fleece and there is very little stretch, which makes it super easy. Double knits and interlock knits are an awesome place to start! And using a stretch needle and a walking foot if you have one, although I didn't start with one... But it does make it a bit easier and keeps things from shifting. You were on fire sewing for KCW! I love the floral knit and this looks do cozy. I felt like I was. :) It was so fun though! I wish I could keep sewing at that rate all the time, maybe I just need to hire a maid... haha. Olivia wants to wear it all the time because it's "so peetty & soft", I'm pretty sure I want one for me too!